06-Aug-2011 -- I returned to this point - but this time while sailing on the Bras D'Or Lakes in company with another sailing boat. We anchored overnight at Little Narrows as the wind was strong and against us. The anchorage was just 400 metres from the point so I took our rubber dinghy and rowed round to the point - which lies in Denas pond. There was quite a strong current flowing out of the pond and wind as well but I was rewarded for my efforts with a view of 2 white-tailed deer. Two eagles also guarded the entrance to the pond. With the wind causing the boat to drift quickly it proved impossible to line up all the zeroes and take the photo but I got pretty close. 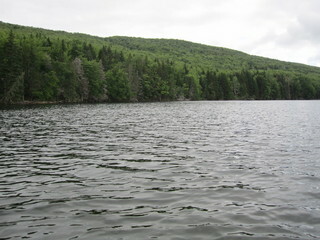 In a small bay of the Bras d'Or Lake, about 50 m from land.